Kell’s parents were part of a group known as the Banff Street Baddies in their Clear Lake, Houston neighborhood and he grew up entertaining right along with them. For almost all of his adult life, he has worked in a wide range of hospitality industry positions – initially in California, managing Kelly’s Coffee & Fudge Factory’s and working alongside Tim Castle as a coffee sample roaster (preparing beans from around the world for customers including Starbucks, Peet’s, & Coffee Bean and Tea Leaf), to making ice cream with Amy’s of Austin, TX. He began cooking with an apprenticeship through the US Department of Labor and has since featured as a Ritz-Carlton pastry chef in Pentagon City, a site chef for A Catered Affair in Washington, DC, and as the executive chef of the Old Hagatna Grill in Guam, the 29 Palms Marine Base in California and the Bear Town Bistro in North Carolina. Prior to coming to Bainbridge, Kell spent three years exploring Spain by bike, tasting fresh fruit from the tree, and touring bodegas by the week on an extensive vino and wine tasting tour. Pegasus’ self-styled ‘Barista-Artista’ is a strong-willed, hard-working, sometimes-a-little-too-adventurous mom of three (two boys and a little girl who thinks she breathes fire). Originally from Southern California (where all the great avocados come from), Jordyn moved up to Washington in 2012. Wicked quick at funny comebacks and full of jokes 24/7, she claims to be an undefeated Uno champ. Jordyn is convinced she could make a great minor league baseball mascot, but then who would get you your lattes in record time? Rivers is a recovering military brat who was stationed all around the world, most memorably in Southern Spain – a home which gave her both an authentic lisp and a love of feria. She spends her time away from Pegasus artistically, making and reading her own custom tarot cards (with designs based on her family and her life), and writing reams and reams of prolific poetry. 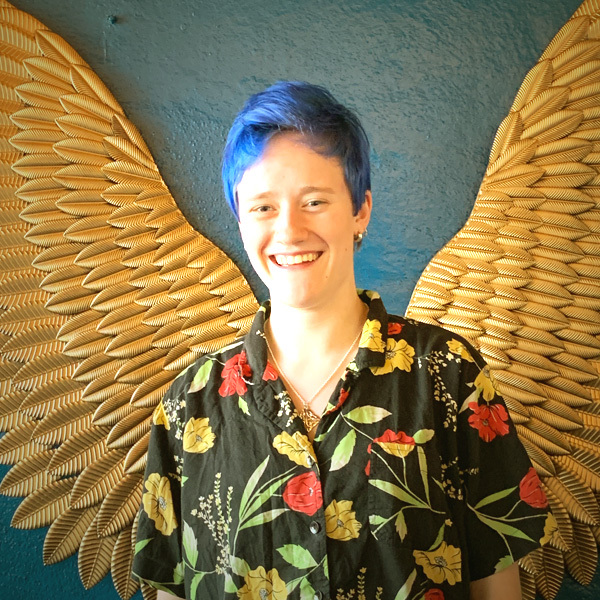 Mikayla is a child of the road – she was born in Silverdale, but grew up in Texas, Panama, Costa Rica, Colombia, Florida, Alabama and California, before landing back on the Kitsap Peninsula in 2017. She is deceptively quiet at first, but promises to get more and more hyper as you get to know her better. Mikayla has become Jordyn’s attentive protegé in the world of tasty caffeinated beverages and still has her mind blown with a new trick or technique on a weekly basis. Frances was born and raised in the culinary world – picking up new skills all the way from the Mojave Desert to El Puerto de Santa Maria and back. Currently a full-time student who bakes croissants as a constructive escape from scholastic life, Frances is happiest covered in flour and surrounded by pastries. 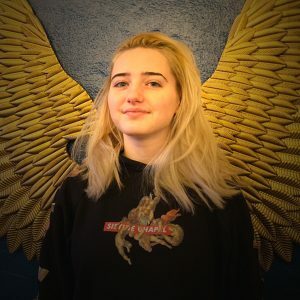 She came to Bainbridge with her family in 2016 and is now the precocious wunderkind of the Pegasus team, fearlessly cooking, baking, and wrestling 200 lbs of pressure to bring you your favorite espresso. Haylee is a born-and-raised Bainbridge Islander who is currently in her return stint at Pegasus, having recently come back to the island from a period of extensive international travel. She makes a darn good cappuccino, claims to be one of the few people who have tried every single one of the (more than 20) teas offered at Pegasus, and enjoys creating abstract coffee art and then inventing plausible stories as to what they actually depict. Away from Pegasus, Haylee is an avid fiddle and electric violin player, became a thrift-store aficionado to fuel her vintage button-up shirt addiction, and recently returned from two months farming olives, grapes and almonds in Southern Spain.